A UCLA study has found that a common strain of Caenorhabditis elegans — a type of roundworm frequently used in laboratory research on neural development — has a pair of genes that encode both a poison and its antidote. The new research also revealed that if worms with the two genes mate with wild strains of C. elegans that don’t have both genes, their offspring who don’t inherit the antidote can’t protect themselves from the toxin — which is produced by mother worms — and die while they are still embryos. 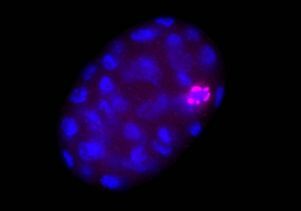 The pair of genes represents one of the clearest examples to date of a “selfish genetic element” at the molecular level. The mechanisms by which selfish elements promote themselves can be subtle. For example, they might alter an animal’s behavior so that it favors mates that have the same genetic makeup. In extreme cases, a selfish gene can require organisms to inherit it for the organisms to survive at all. The researchers were studying an unusual strain of C. elegans, called DL238, that was isolated from a reserve in Hawaii. When they crossed those worms with the standard worms, called N2, that are used in most labs, the scientists noticed a long stretch of DNA where offspring always inherited the N2 copy. Their experiments showed that this was because worms inheriting DNA from the DL238 worm were dying during their development as embryos. When the researchers studied the genes within that stretch of DNA, they were surprised to find that DL238 was missing a gene called pha-1, which was thought to be required for the development of the worm’s feeding organ. However, the researchers showed that pha-1 was actually an antidote to a toxin, sup-35, that was also missing in DL238. Together, these genes make up a selfish element, rather than being important components of worm development. Scientists have long been interested in using selfish genes to stop the spread of pathogens, such as the malaria parasite. The pha-1/sup-35 system offers a starting place to explore how selfish genes propagate. The researchers write that the finding also suggests that selfish genetic elements may be hiding in plain sight under scientists’ noses, and might be more common than previously thought. The pha-1 gene had been well-studied but there were no previous hints that it was merely an antidote to a toxin, which raises the possibility that other developmental genes could turn out to be antidotes to as yet undiscovered toxins. All of the study’s authors are faculty and researchers in the UCLA’s department of human genetics and department of biological chemistry. The co-first authors are Eyal Ben-David and Alejandro Burga; the senior author is Leonid Kruglyak, who also is an investigator with the Howard Hughes Medical Institute. Ben-David will present the findings May 12 at the annual Biology of Genomes meeting at Cold Spring Harbor Laboratory in Cold Spring Harbor, New York. The research was funded by the Howard Hughes Medical Institute, the National Institutes of Health (R01 HG004321), the Jane Coffin Childs Memorial Fund for Medical Research and a Gruss-Lipper postdoctoral fellowship from the EGL Charitable Foundation.